Our staff at Orkney Creative Hub are a very talented bunch, hence why we decided to have an exhibition showcasing their skills this month at For Arts Sake. For those unaware of OCH and its work, it’s a space that promotes art for the islands, offering a range of art and craft workshops aimed at all levels (you may already know of some that take place in our space at Number 25), we also sell art supplies and showcase the work of a number of talented Orkney artists in our shop and gallery at For Arts Sake. If that didn’t keep us busy enough, we also help with the making and printing of The Orkney Advertiser! Our staff can certainly be kept busy at work but what do they get up to in their spare time? Jan Judge who runs the whole show and our regular spinning workshops is a great textile artist, currently in the gallery is a range of her weaving and home-spun and knitted pieces, her shawls made of alpaca and cashmere are certainly garnering attention as to how soft and delicate they are. Kim Fletcher and Cassie Sinclair lead a number of the workshops at Number 25, they’ve offered some beautifully coloured paintings, handcrafted-jewellery and detailed sketches. I, Stephanie Cullen, tend to For Arts Sake and its gallery, also put in some paintings and needle-felt pieces for display. Sam Gray and Natasha Morgan are students at Orkney College and regularly help us out, Sam has chosen to display her handmade paper while Natasha has entered some delightful sketches. 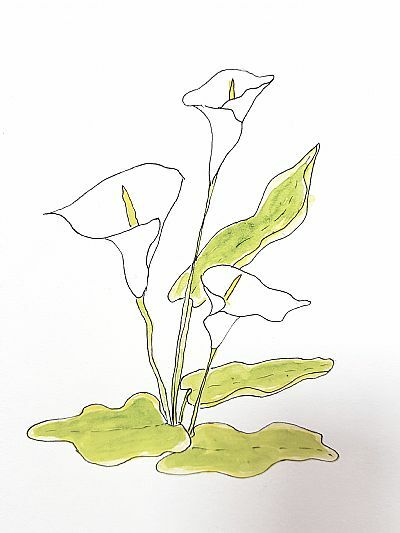 However, our dark horses are Ali Turner-Rugg and Gary Scollay, the former works with us once a week and has only just started using watercolours but has offered some beautifully designed floral pieces. (It should be said that we knew Ali was a good artist, her usual speciality being pots and clay-work which we are also lucky enough to display but we were taken-aback by how quickly she’s taken to doodling in her free time!) Meanwhile, Gary is our “tech-guy”, we joked that he had to learn some crafts while working with us but he surprised us by taking to knitting and has become a favourite among our regular knitting group. He is now kept rather busy with a long list of folk demanding knitted socks from him. However, for the exhibition, he has entered some of his marvellous photography which features a number of well-known Orkney cats, including the renowned “Kirkwall Tesco Cat”. We certainly are a creative and somewhat eccentric bunch, come see our work at For Arts Sake, the gallery is open Monday-Friday 10-5 and Saturdays 10-4. Also, don’t be afraid to ask at the shop if you wish to take part in some of our workshops!